Bubbles often occur even as demand rises dramatically. Many firms jump into the market to cash in on this rapid growth, and even though the market is growing, it simply can’t support all the new entrants. Plenty of companies full of smart, talented and hardworking people with great products still fail spectacularly. So with lots of new craft breweries forming and with existing breweries expanding capacity, there’s been plenty of speculation about whether the craft brewing industry is headed for a bubble. If it is, plenty of great breweries making good beer with good business plans will go bust. Such is the unfortunate nature of bubbles. I’ve read a number of interesting speculations on a craft beer bubble which has inspired me to take a closer measure of the issue. If you bare with me, I’m going to use a little math the investigate the whole bubble question. Don’t worry, it’ll be just some simple addition, subtraction and multiplication that hopefully I’ll make clear enough along the way. To get right to the punch line, some straight forward “back of the envelope” calculations suggests tough going ahead for craft breweries even under fairly optimistic conditions. We appear to be coming to a point where too many breweries are producing far more beer than the marketplace can absorb. While there will still be room for small breweries and brewpubs producing less than 1,000 barrels a year, there will be increasing pressure for larger breweries to remain profitable with so much excess capacity coming online that can’t all be sold in the marketplace. This matters because breweries can’t sell enough beer, or need to heavily discount their pricing due to the excessive supply, they will struggle to pay off the loans most of them have on their books. 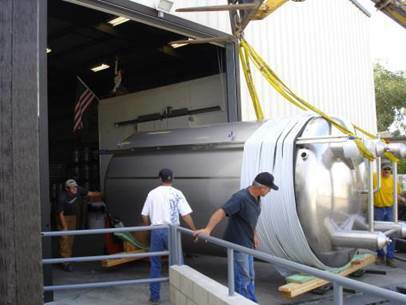 Breweries require large capital equipment costs, and most new breweries operate under some form of financing. Of course, they also need to pay for operating expenses like payroll, materials, and rent. Let’s delve into the numbers that cause me to reach for this conclusion, starting with the demand side of things. Everyone knows the recent growth of craft beer is nothing short of remarkable. The latest release by the Brewer’s Association cited an estimate of 7.3 million barrels of craft beer sold in the first half of 2013, a growth of 15% over the previous year. Recent growth rates of 10-15% in the craft beer industry recently are pretty common. And the good news is that since craft beer is only about 10% of the beer currently produced, the 15% growth level can compound for quite some time before the beer industry output by volume is produced by a majority of craft breweries.. Whether or not this 15% growth is sustainable for the next few years is an open question based on other factors such as market penetration, changing customer preferences, distribution systems and current demographics. Of course, if this growth rate settles down to a more modest 10%, the compounded demand will slow considerably. Just take that 7.3 million barrel figure for the first half of 2013, or 14.6 million sold annually. If the current rate of growth stays at 15%, that means 16.8 million barrels will be sold in 2014, or 2.2 million additional barrels. But if the growth rate slows instead to 10%, then instead only 16.1 million barrels will be sold, or 0.7 million barrels less than with 15% growth. I’m going to use the current 15% growth rate in my analysis, even though it may be optimistic to expect the craft beer industry to continue this torrid rate of growth with a mature product. In addition to numerous new breweries in the works, plenty of existing breweries have announced expansion plans or in some cases have announced building second breweries. So to look at the Supply side of the craft beer bubble question, let’s look at both expansion plans of craft breweries couple with reasonable expectations of the output of all these new breweries. It should be also noted the Craft Beer Alliance, technically not a “Craft Brewery” due to a substantial ownership by Anheuser-Busch added 140,00 barrels of capacity in the last year. Furthermore, another one of those pesky “crafty” breweries, Goose Island has transferred much of their production to larger Anheuser-Busch facilities as part of a nationwide roll-out so we should expect at least a few extra hundred thousand barrels of capacity a year as part of that development. Of course, Blue Moon is still out there, selling more beer than the entire craft brewing industry. Since I’m using Brewer’s Association data, I can’t really include these breweries defined as non-craft in the analysis, but needless to say, these breweries are also capitalizing on changes in the beer market and certainly aren’t making it any easier for a new enterprising craft brewery. According to Brewers Association, another 1,605 breweries are in the planning stages. If existing breweries will bring an estimated 4,000,000 barrels of beer online in the next two years, how much room is left in the marketplace for these new breweries? If the growth of craft beer declines to 10% growth, it’s looking a bit grim for all these new breweries, since existing craft breweries have enough extra capacity to supply 900,000 more barrels of beer that will be demanded in 2015 at 10% compounded growth. Suppose for the next two years, it’s full steam ahead and growth continues at 15%. By the end of 2015, all 1,605 of these new breweries will fight over the remaining 700,000, a mere 436 barrels per brewery. That’s the yearly output of a small brewpub. Since roughly half of the current number of craft breweries are defined as brewpubs that should be fine for many of them. For the other half aspiring to be a successful microbrewery or regional brewery, their 436 barrel per year share is likely to be way too low to be profitable. The craft brewing industry makes about $850 in revenue per barrel of beer, so 436 barrels translates to $370,000, ost likely insufficient to support a stand alone brewery. A brewery this size could exist through contract brewing. Yes, it’s possible that the growth of craft beer could further accelerate to 20% growth but that would be highly unprecedented. Call me a pessimist, but 10% growth next year seems much more realistic than 20% growth. Don’t forget, the assumptions above are all based on what I think is a reasonably conservative 4,000,000 barrels of capacity coming online by existing breweries and recent expansions by the Craft Brew Alliance and Goose Island have been left out of the analysis. Even under the rosiest scenario, we see that a lot of breweries are clearly going to be under considerable pressure to stay in business and a number of them will probably fail. How many breweries will fail? There’s not enough precision in the numbers to make that sort of prediction. However, lots of people make bold predictions all the time while totally ignorant of the relevant data, so why should that stop me? I predict starting next year, life starts getting pretty difficult when Sierra Nevada’s and Lagunitas’s new breweries come online, Boulevard Brewing and Dogfish Head continues their expansions, and Goose Island’s national roll out is in full swing. The current failure rate of craft breweries is 1-2%. It’s reasonable to expect this number to grow to 5-10% starting in 2014, which means 100-200 breweries will close per year. Given the chumminess of the industry, I expect smaller breweries to join forces in the face of tough business climate and some brewery consolidation to occur. In addition, I expect some breweries founded with aspirations of becoming 50,000+ barrel operations will find themselves stuck struggling to barely keep afloat selling 2,000-3,000 barrels each year and fold up their tents for greener pastures. Things could turn into a blood bath, with failure rates as high as 25%, but more likely, the industry will go through a difficult 2-3 year correction as the weaker players are weeded out, and then things stabilize. That’s my best guess. There’s been much cheering and fanfare reverberating throughout the brewing community about the latest brewery numbers recently released from the Brewer’s Association, who counted exactly 2,126 breweries in the United States. To put that into context, you have to go way back to 1887 when the United States had that many breweries. It’s an astonishing 47% increase from just five years ago in 2007 when the tally was a mere 1,449, despite the United States slowly recovering from a serious recession over this period. And according to the Brewers Association, another whopping 1,252 breweries are in the planning stages. Where is it all going? The growth shows no sign of stopping and the biggest problem most breweries have is that they can’t brew beer fast enough. But can the market really absorb all these new breweries? Are we headed for a cataclysmic brewing bubble where legions of brewers, their big dreams busted, are left to contemplate selling insurance? Or is brewing reaching a critical mass, only to explode even more intensely in a thermo-nuclear frenzy of fermentation? Now you have a chance to weigh in on these questions. For this month’s Session, tell us how many breweries the Brewer’s Association will count five years from now in 2017, and why you think it will be that number. We greatly appreciate international perspectives on the US brewing industry and look forward to predictions on US brewery numbers from outside America’s shores. Or if they prefer, they can make a similar prediction about the brewing industry in their home country. Feel free to use complex mathematical econometric models, top secret brewing industry information, or your favorite dart board, and post your prediction on Friday, September 7th. Share your link in a comment to this post, or send it to me in an e-mail from a link you’ll find here. I’ll post the round-up a few days later. Posted on August 13, 2012 April 2, 2017 Categories Brewing Association, number of breweries in the United States, The Session, thermo-nuclear frenzy of fermentation14 Comments on The Session #67 Announcement: How Many Breweries in 2017?